Ovations Dining Services - Specializing in high-quality management of food and support services in the Greater Detroit area. Ovations Dining Services, LLC is a management firm specializing in the personal, high-quality management of food and support services in Southeastern Michigan. Whether we're creating imaginative menus or initiating new approaches to environmental services, considering the possibilities is what makes true excellence possible. The company's senior executives have over 50 years of combined food and environmental service management experience with long traditions of enhancing the quality of life for their clients and customers. Founded in 1998 as an alternative to the large food service corporations, Ovations Dining Services was formed to return to the specialized, personal service their respective clients desired. 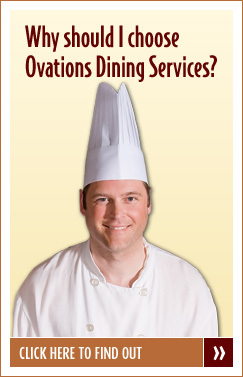 Today, Ovations Dining Services continues its traditions of service excellence. Our responsibility is to support our clients with the most effective and efficient systems, the best-trained people, and an uncompromising spirit of cooperation to help them to be the best that they can be. Exceeding our clients' and customers' expectations is Ovations' constant focus and our local flexibility makes it work every day. Copyright © 2019 Ovations Dining Services L.L.C. All Rights Reserved.